The October 2018 IPCC Special Report, dealing with the consequences of global warming of 1.5°C (IPCC 2018), identified existing consequences of climate change and projected future calamities even given countries’ ambitious climate policies. Proposed policies under the Paris Accord will fall way short, and the election of President Trump significantly reduced the ambition to implement policy in the US. Might investors, with strong financial incentives to take the long view, respond to environmental concerns? Anecdotal and survey evidence suggests that investors take account of environmental matters, and of climate change in particular, in their investment decisions (Krueger et al. 2018, for example). If the marginal investor responds in way that lowers the share price of less climate-conscious companies, it will nudge them toward climate-sensitive business practices (Heinkel et al. 2001). In this case, market forces help the transition to a low-carbon economy. But there is little evidence that investors at large really value a firm's climate-related performance. In recent work (Ramelli et al. 2018), we provide clear evidence, using the stock price responses to the Trump-era climate policy shock, that a firm's climate-related performance does affect its market value. First, candidates Trump and Hillary Clinton held opposite positions on climate change. In particular, Trump vowed throughout the his campaign to dismantle a large part of the Obama administration's environmental protection and climate policy. He promised to scrap the Clean Power Plan (CPP) and withdraw the US from the 2016 United Nations Framework Convention on Climate Change (UNFCCC) Paris Agreement. Second, President Trump’s victory on 9 November, 2016 was unexpected. On Election Day, the betting market on Betfair gave Hillary Clinton a 83% probability of winning, and the sophisticated polling on FiveThirtyEight gave her a 72% chance of victory. Would the 2016 election shock benefit 'dirty' or 'clean' firms? The overall effect on firm values of this sudden change in expected climate policy is less obvious than one might think. Firms differ in both environmental footprints (greenhouse gas emissions, for example) and climate strategies (the extent to which they are implementing voluntary, self-regulatory actions in the transition to a low-carbon economy). One would expect firms making extensive use of fossil fuels, and other 'dirty' companies, to benefit from the election outcome relative to firms in 'clean' industries. But previous research makes mixed predictions about how corporate climate responsibility affects firm value. On one hand, a decrease in regulatory risks and a pause in public policy initiatives on climate change should benefit firms that currently have weak environmental strategies. The expected regulatory costs and risks – based on a likely Clinton victory – that had been priced in to firm valuations, and thus discounted their share prices, became less likely to materialise. On the other hand, investors may put a premium on firms’ future climate-related policies for two reasons. First, they may be committed to the transition to a low-carbon economy, and so willing to pay more to be a symbolic part of it given the expected environmental hostility of the Trump administration. Second, investors may think that climate-responsible firms will do better in the long run, which in turn would feed back to the present prices of climate-responsible firms. We examine the impact of the shock, given these measures of firms’ climate involvement. the nomination of Scott Pruitt to head the Environmental Protection Agency (EPA) on 7 December 2016. Pruitt’s selection strongly reinforced the beliefs about President Trump’s determination to dismantle, or severely curb, existing environmental protection rules and plans. We investigate the cross-section of stock-price reactions to these events. We control for standard firm characteristics and their differential exposure too the expected policy changes after theTrump election (including tax and trade). As the measure of current emissions, we use carbon intensity, defined as the firm’s annual total absolute greenhouse gases (GHG) emissions divided by its market value of equity. Our second variable of interest – namely, efforts to curb future emissions – is represented by climate responsibility, the extent to which a firm has undertaken voluntary initiatives to manage the risks and opportunities inherent to the transition to a low-carbon economy. Such initiatives would include adopting emission reduction targets and implementing investment plans to improve energy efficiency. We obtained data on firms’ carbon emissions and climate responsibility from two leading providers of environmental, social, and governance data: MSCI KLD and Vigeo Eiris. Importantly, emissions and climate responsibility are only weakly correlated. This confirms that they capture different aspects of firms’ climate-related performance. Figure 1 shows that investors reacted to the 2016 climate policy shock by rewarding companies in high-emissions industries, at least in the short run. This result is expected and is in line with the common narrative reported in the media. Figure 2 shows a surprising result. 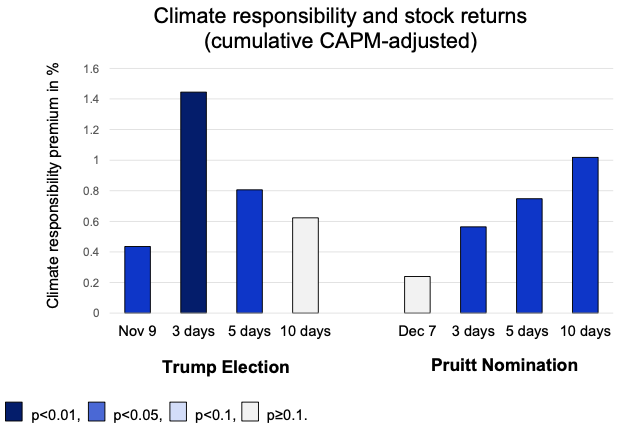 Following both the election and the nomination of Pruitt, investors rewarded companies demonstrating more responsible climate strategies, holding fixed other factors including their level of emissions, taxes and foreign revenues (Wagner et al. 2018), and industry fixed effects. For example, an advanced climate responsibility designation according to KLD, a status awarded to 11% of firms in our sample, is associated with a cumulative CAPM-adjusted return that was 81 basis points higher by the end of the fifth trading day after the election. From the election to year-end 2016, this differential increased to 225 basis points. Similar findings hold when using the Vigeo Eiris climate responsibility measure. Source: Wagner et al. (2018). Why is there a climate responsibility premium? Current preferences. Increased concerns for global warming may have made pro-environmental investors more willing to accept a lower rate of return in exchange for the 'warm glow' (Andreoni 1989) received from investing in such firms, and the simultaneous avoidance of the 'cold shiver' of holding climate-irresponsible firms. Future expectations. Investors may reward more climate-responsible firms today because they expect them to do better in the long-run because they anticipate that future investors will receive an increased warm glow from holding such firms when the administration is over, both in response to its tactics and because environmental conditions have worsened, and a boomerang effect of substantially tightening governmental climate regulation after the Trump Administration departs office, due to intensified attitudes or worse environmental conditions. To test the current preferences and future expectations hypotheses, we analyse how different types of institutional investors adjusted their portfolio holdings after Trump’s election. We find that the shift towards climate-responsible firms after the 2016 climate policy shock is stronger for longer-term investors. This suggests that the outperformance of climate-responsible firms can be at least partially attributed to a future expectations explanation. Long-horizon investors seem to have reacted to President Trump’s election by looking beyond his presidency and anticipating investor demand for climate-responsible firms will increase and climate regulation will become more stringent than would have otherwise been the case. We also find that institutional investors with large holdings of climate-responsible firms before the election reduced them afterwards. This does not support the current preferences hypothesis among institutional investors, although it may still have played a role among other types of investors. We do not reach a pollyannaish conclusion that market forces can fully substitute for formal regulation in the correction of climate externalities. They cannot. The net effect of the 2016 Trump election shock on prospects for containing climate change may well be strongly negative. But that dark climate cloud does have a moderate silver lining. While some observers assert that financial markets put a premium on short-term thinking, our analysis identifies a significant group of investors who raise the value of firms taking a long-term perspective. In this instance, they value firms that make climate-responsible choices in preparation for a more climate-conscious future. In short, stock prices can be tonics or a tocsin. Andreoni, J (1989),"Giving with impure altruism: Applications to charity and Ricardian equivalence", Journal of Political Economy 97: 1447--1458. Heinkel, R, A Kraus, and J Zechner (2001),"The effect of green investment on corporate behaviour", Journal of Financial and Quantitative Analysis 36: 431--449. Intergovernmental Panel on Climate Change ((2018), Special Report on Global Warming of 1.5°C, IPPC. Krueger, P, Z Sautner, and L T Starks (2018), "The importance of climate risks for institutional investors", Working Paper. Ramelli, S, A F Wagner, R J Zeckhauser, and A Ziegler (2018),"Stock price rewards to climate saints and sinners: Evidence from the Trump election", CEPR working paper 13206. 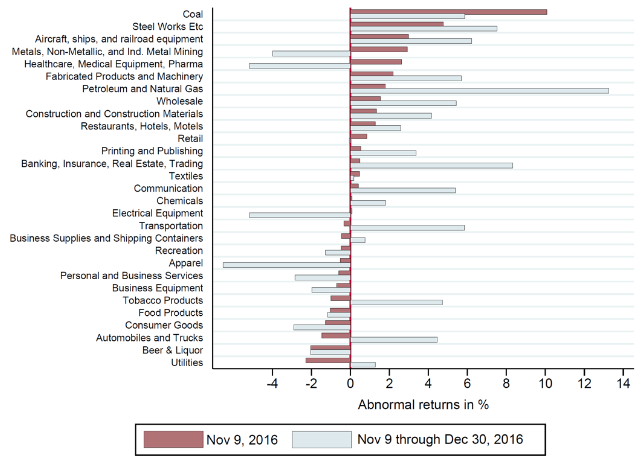 Wagner, A F, R J Zeckhauser and A l Ziegler (2018), "Company stock price reactions to the 2016 election shock: Trump, taxes, and trade", Journal of Financial Economics 130: 428-451. Frank P. Ramsey Professor of Political Economy at the Kennedy School, Harvard University.